You can import/export newsletter subscribers from one store to another. You can manage data of customer newsletter subscribers as well as guest subscribers. You can set subscribed status such as Subscribed, Unsubscribed, Not Activated and Unconfirmed easily. You can export newsletter subscribers according to store view. The module includes sample CSV file template. The extension can support multi-stores and multi websites. Are you moving your store from one platform to another? Use the Magento 2 Import Export Newsletter Subscribers extension. Just like the name suggests, the module will help you in import/export of newsletter subscribers. You can manage information of registered customers as well as guest visitors who have subscribed for newsletter on your website. The easy, simple-to-use extension can export newsletter subscriber data according to store view at the click of a button. 1) Prepare your CSV as per our documentation. 2) Go to Your Site Backend -> SYSTEM -> MageBees – Import/Export Newsletter Subscribers -> Import Newsletter Subscribers. 3) Please upload your csv file and click on “Import Newsletter Subscribers” button. 4) After successfully importing newsletter subscribers, your subscribers will be displayed on admin -> MARKETING -> Communications -> Newsletter Subscribers. 1) Go to Your Site Backend -> SYSTEM -> MageBees – Import/Export Newsletter Subscribers -> Export Newsletter Subscribers. 2) Please click on “Export Newsletter Subscribers” Button. 3) Now successfully export newsletter subscribers. You can get exported csv file in /var/export/ file. I am very much satisfied with the extension. 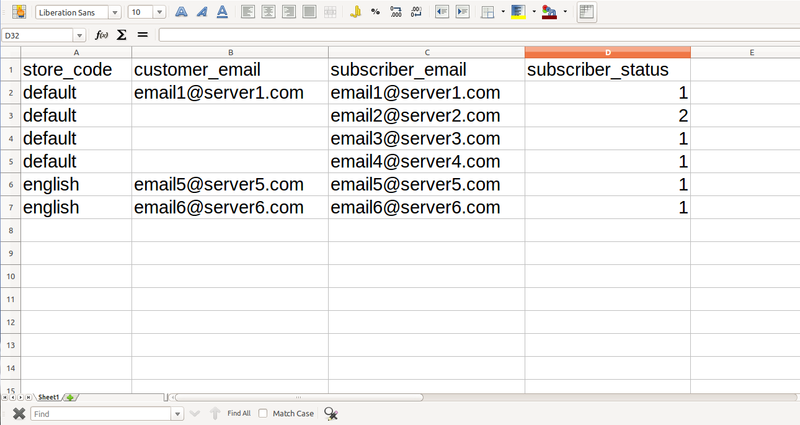 I was able to import a ton of newsletter subscribers with just a CSV file. The module definitely makes management of subscribers easy. The best function of the Magento 2 module is that you do not have to worry about guests subscribers at the time of import. All the information along with subscription status remains intact. Worth the purchase. I have large number of newsletter subcribers and I need to import into my new Magento 2 store. It works charm and done within few minutes. Luck to get this extension because its save my time. Does everything as portrayed and there is an extremely pleasant and snappy support! Easy to configure and works as expected. Additionally the help is totally astonishing! This extension is very easy to import, export newsletter subscribers .Support is extremely proficient and quick. This extension is simple but fast and effective for Importing Newsletter Subscribers. Its done my work quickly and save my time. Great extension - it works very good! This Extension is really useful. Installation of this extension was very easy and has worked as described. Thank you for the contribution. You can export store view wise newsletter subscribers. Q-1: I have installed import export newsletter subscribers extension but I got following error. “There has been an error processing your request. Please upgrade your database: Run bin/magento setup:upgrade ”. Ans: Run “php bin/magento setup:upgrade” command to your terminal or command prompt. Please see the installation steps for that. Q-2: I clicked on "Import Newsletter Subscribers" button but got the following error "Requested store is not found". Ans: This error shows that "importnewsletter.csv" is not properly created. The reason can be error in insertion of store code in store_code field. So please assign true store code to solve the problem. Q-3: I am getting max execution time error, what should I do? Ans: If you are getting time-out error, then increase the time-out limit. For doing so, you may have to consult your hosting guy. Q-4: I am getting “‘var/export’ directory does not exist!” error? Ans: This error occurs when “var/export” directory does not exist or does not have write permission.